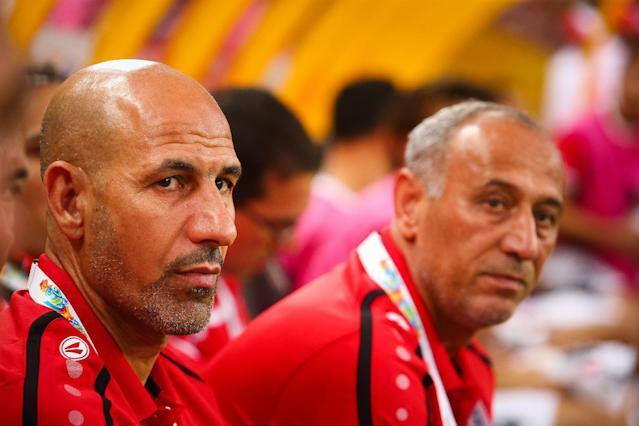 Canberra (AFP) - Iraq coach Radhi Shenaishil leapt to the defence of embattled referee Ben Williams and slammed Iran boss Carlos Queiroz after temperatures rose in their Asian Cup thriller on Friday. Shenaishil, speaking after Iraq's 7-6 win on penalties, said Iran spent much of the quarter-final trying to pressure the officials and blamed them for causing an ugly atmosphere. Queiroz was incensed after Australia's Williams sent off Mehrdad Pooladi for simulation, his second bookable offence, just before half-time. Iran were leading 1-0 at the time but arch-rivals Iraq equalised and it finished 3-3 after extra time before the 2007 champions won a marathon shoot-out. "I think Iran's focus after getting the red card was to put pressure on the fourth official to show a red card to one of our players," said Shenaishil. "They concentrated on that which was wrong. They should concentrate on the match. The referee gave all the yellow cards at the right times tonight," he added. Williams dished out 10 yellow cards altogether in a stormy encounter. Queiroz, fined earlier in the tournament for criticising Williams, again lashed out at the official. Tempers flared at times with substitutes from both teams encroaching on the pitch following all four goals in extra time. Shenaishil was particularly upset about a shoving match when Iran goalkeeper Alireza Haghighi went down hurt just before the end of extra-time. "I have all the respect for the Iranian team, they're a strong side. But I think they were under pressure. The pressure came from the coaching staff on their bench which was wrong," he said. "They scored, were leading 1-0 and they should have been a bit more relaxed. Their substitutes entered the field. This gives a bad reputation for the competition so they should look into these things more," he added. Shenaishil said his main priority was now the full recovery of his players in time for Monday's semi-final against South Korea. "We respect South Korea, they're not an easy team. It will be a tough game, he said."